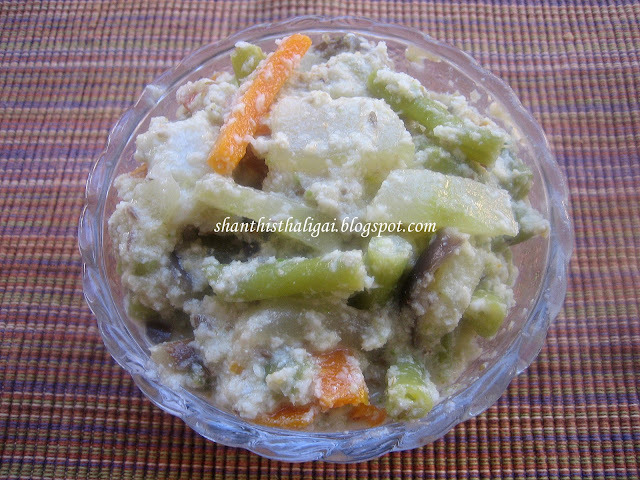 Aviyal is delicious south indian sidedish made with mixed vegetables. It is a traditional recipe of kerala. Soak cumin seeds in water for 5 minutes and grind it along with scraped coconut and green chillies. Cut all the vegetables into thin long strips. Cook the vegetables in very little water and salt. When done add the ground paste and allow it to boil till the raw smell goes away. Switch off the stove and add the curd and mix well. Pour the coconut oil into it and mix well. This is an excellent combo for adai also. The avial looks delicious and nice. My favorite.Tempering is not required? Happy pongal and this aviyal looks fantastic..
Hi Shanthi Happy Pongal. Avial looks delicious. I was in India at home celebrating Kanu pongal last year - my daughter had a blast singing the Kakkai song - she loved it! I have to do it here this year I guess! Aviyal looks great! Wow,Yummy aviyal,I feel like eating as such! Hi Shanthi I have an award waiting for u in my blog. you can collect it. avial paarkave supera iruku! happy kanu! thaligai.All the 3 blogs of yours make me feel proud that i too am Iyengar. Glad that I have a Blog to follow from today. just stumbled by in your blog when i was serching..great space..lots of info and good recipes too..i am following your blog..
Lovley avial. Very informative.One of my favourite dish.